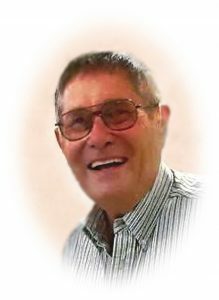 John F. Muehlich, 76, of Schuyler, died April 4, 2018 at his home. Military Honors, Hespen-Mitchell Post # 4836 of the V.F.W. John F. Muehlich died at his home in Schuyler, April 4, 2018, following an 18 month battle with ALS. John was born November 4, 1941, in Schuyler to Lyman and Naomi (Holman) Muehlich. After High School John entered the United States Army, serving for two years. On July 10, 1964, he married Nellie White in Schuyler, where they made their home and raised their four children. John worked as Service Manager at Wigington Chevrolet and in 1973 started John's Tune-up and Service in what is now the Healy Agri Service Building In Schuyler. He and Nellie then operated John's Standard Station and eventually added Muehlich Oil, bulk farm service. After "retiring" John worked in Food Service for Schuyler Schools and was a crossing guard. John and Nellie later worked for 6 years for the Branched Oak Park System, which he loved and did it as long as he was able. John is a past member of the Schuyler Eagles, Schuyler Volunteer Fire Department, American Legion and a lifetime member of the VFW. He enjoyed woodworking, gardening, camping and fishing and especially loved time spent with the grandchildren and great-grandchildren. Surviving John is his wife, Nellie of Schuyler, three daughters; Tammi (Mark) Vyhlidal of Fremont, Linda Muehlich Prochaska of David City, Penny (Craig) Vyhlidal of Eustis, one son Gene (Sheri) Muehlich of Schuyler, three sisters; Carol Whitmore and Gale (Gene) Furry, all of Lincoln, Judy (Roy) Walling of Fullerton, California, a brother, Garry (Kathi) Muehlich, Alta Loma, California, step-sister, Jan Kruger of San Marcos, California, 13 grandchildren, 7 great-grandchildren, nieces, nephews and his dog, Rocky Mountain Special, Jr.